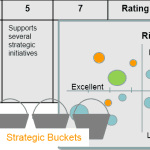 Strategy 2 Market > items > Is Portfolio Management More Important Than Strategy? Is Portfolio Management More Important Than Strategy? We recently received an email containing the statement that ‘portfolio management is more important than strategic planning.’ The email went on to imply that an organization can be successful without a strategy, that is, if they have a good portfolio management system. This sounds like putting the cart before the horse, the shot before the aim, the dessert before the dinner. Well, maybe not that last one! Strategy has to be defined before you start prioritizing or executing projects in the portfolio, otherwise how will you know if you are wasting resources on the wrong projects? Think of strategy as 1) where you are going, 2) how you will get there, and 3) how you will know when you have arrived. It’s a goal, a set of initiatives and metrics. 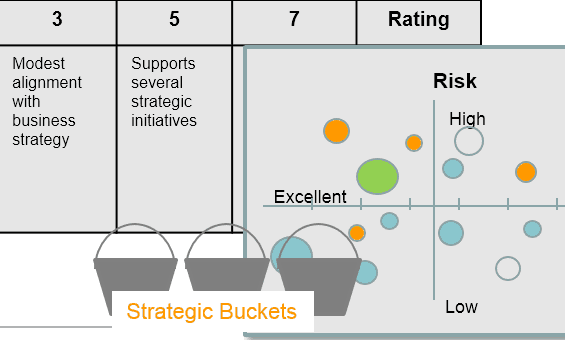 Strategy is what directs the decision-making in the portfolio management process; it dictates the level and types of risk the organization is willing to take, the return required, the types of resources to be leveraged or developed, and how resources will be allocated among the strategic initiatives. Management, and the entire organization, have to be aligned on the direction of the organization in order to execute a successful portfolio management process, and indeed the entire product development system. All the elements of the product development system are critical and have to work together, but logically, strategy has to come first.